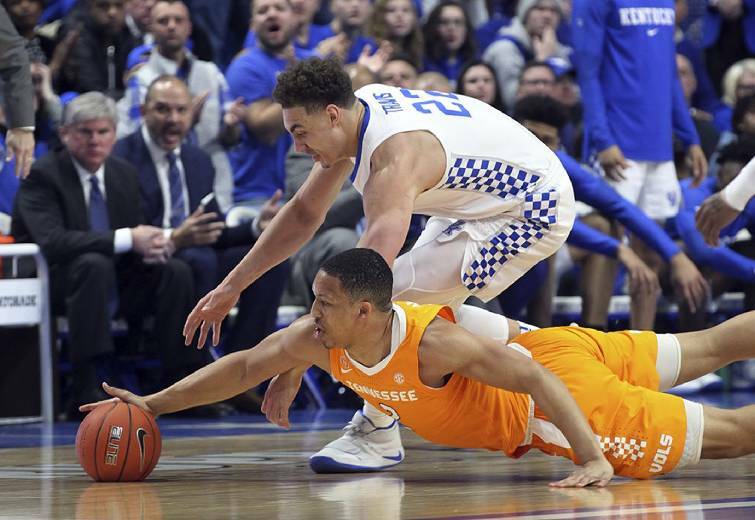 Kentucky's Reid Travis, top, and Tennessee's Grant Williams chase down a loose ball during the first half of Saturday night's top-five showdown in Lexington, Ky.
LEXINGTON, Ky. — Tennessee never seemed right Saturday night. Beaten to loose balls. Pounded on the boards. In a surprising twist, the Volunteers were the less physical team against Kentucky. But it was a phrase uttered by coach Rick Barnes that may have resonated the most after his top-ranked Vols fell 86-69 to the fifth-ranked Wildcats in front of a wild crowd of 24,467 at Rupp Arena, putting an end to Tennessee's program-record 19-game winning streak. "I thought it was the most selfish we played all year," he said. Tennessee (23-2, 11-1 Southeastern Conference) had a season-low 11 assists and shot 41 percent from the field. The poor offensive performance bled over to the defensive end, where the Wildcats shot 55 percent from the floor, the highest the Vols have allowed all year. Jordan Bone had 19 points and six assists to lead the Vols. Admiral Schofield finished with 17 points and six rebounds but shot 7-for-18 from the floor. Grant Williams had 16 points and eight rebounds on 8-of-9 shooting from the free-throw line, but Jordan Bowden and Lamonte Turner shot a combined 3-for-18 from the field, while Kyle Alexander had four points and three rebounds before fouling out. Kentucky (21-4, 10-2) won the battle of the boards 39-26, led by 13 rebounds from guard Tyler Herro. The Wildcats had 12 offensive rebounds that turned into 17 points and had 36 points in the paint to Tennessee's 20. P.J. Washington led the Wildcats with 23 points, while Keldon Johnson had 19 and Reid Travis 11. "This is the most selfish I've seen us play in three years," Williams said. "I wasn't sure if it was the environment, but we didn't execute what we wanted to do. We needed this, though: We're going to challenge each other, because that's not how we play, that's not how Tennessee is. Offensively, we were taking bad shots — they were open, but not what we wanted — and on defense, we allowed them to bully us. "For that to happen, it shows we were phonies tonight." It was only the second time this season that Tennessee had allowed an opponent to top 50 percent from the floor; the other was Kansas, which defeated the Vols 87-82 in overtime on Nov. 23. The Vols host Vanderbilt on Tuesday before going back on the road to face LSU, which is also 11-1 in the league after defeating Kentucky on Tuesday and Georgia on Saturday. The Wildcats led 37-31 at halftime while shooting 59 percent from the field but blew the game open with a 14-0 run to start the second half and outscored the Vols 23-5 over the first 6:37. Tennessee eventually responded, with a 15-2 spurt to cut the gap to 62-51 with 8:49 to play, but couldn't get any closer as the Wildcats continued to pound the glass and limit any quality chances for a comeback. "We let what we were doing on offense affect us on the defensive end," Barnes said. "They were getting offensive rebounds in the first half; getting to more 50-50 balls. We had chances to get a couple of stops, but then we gave up offensive rebounds. We went with a small lineup and P.J. Washington had his way."